Bruno Voigt, born in Gotha, Thuringia, was the son of a teacher and drawing instructor. His father, always active in the Social Democratic Party, was one of the instigators of the 1918 revolution. Voigt began his studies in Gotha, but transferred to the College of Fine Arts in Weimar after the death of his father in 1924. There he became involved in the political action group Red Unit and worked with the political cabaret Red Rockets. By 1932, his artistic career began to take off, and he signed a contract with Bavaria Verlag, Gautig, to publish his caricatures and prints. 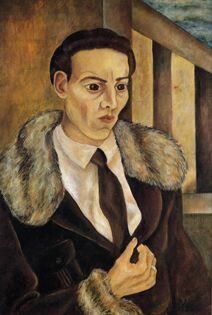 Voigt’s art and politics were already inextricably entwined, and in December 1933 he founded the Left Cartel of the Workers of the Mind to combat the Third Reich. He was also a member of the Weimar chapter of the Association of Revolutionary Artists in Germany. His studio was searched by the police and the SA, and under Nazi pressure, his contract with Bavaria Verlag was dissolved. In 1936, he moved to Ulrichhalben near Weimar, and, recognizing the escalating danger, suspended all of his political activities. Voigt was drafted into military duty in 1941 and wounded in 1944. After his transfer to a military hospital in Holland, he deserted the German militia. He was hidden by a Dutch farmer until being captured by the British army and made a prisoner of war in Rouen, where he served as a translator. In 1947, he was released from captivity and returned to Gotha, which was then in the Soviet-occupied zone. He attended the School of Socialist Unity Party in 1948 and became a city councilman in Gotha. In the 1950s, Voigt became involved in arts administration and was appointed as a division head at the ministry of culture and as the director of the East Asian Collection at the State Museum of Berlin. In 1983, he retired from the directorship and resumed painting and drawing. His work was exhibited in galleries throughout Germany, and in 1986 he was included in the exhibition German Realist Drawings of the 1920s at the Guggenheim Museum in New York. Voigt died in 1988 in East Berlin.